Updated: we were informed that is a fake cover. Please tell me that’s a joke? It’s absolutely awful. 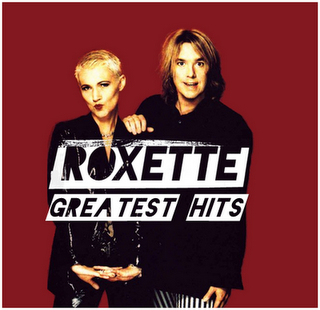 There are some fantastic iconic photo shoots of Roxette, and that’s the best they could use? The good news: I’ve never seen this picture before and it’s always interesting to see a new Roxette-picture. The bad news: The picture is really horrible!!! I guess this was shot around 1995 and yes, it looks like that! If they wanted to make them look very old, they got what they wanted! Especially Per looks so much out of time and Marie is such a beautiful woman, but these kissing-lips are a bit over the top. I don’t like to say it, but the cover looks old-fashioned and cheap. Best thing about it is the red background and the writing. I agree so much with Thomas, there are better pictures! They could have taken for example the one from their Facebook-profile, this is way better! HAHA, come one! The 2006 compilation has a cover that is far worse than this! Was it iconic? No way. Ah, no need to mention One Wish. By the way, it’s clearly stated in that website that the picture is NOT the cover of the forthcoming compilation (“Esta no es la tapa del compilado”). You should check twice before posting things like this. I forgot: I have the feeling that the real cover will be FAR WORSE, maybe just a plain (and old) pic of them in a white background and a generic font. The “Don’t Bore Us” 2000 was quite awful in terms of design too. When I shared the information I was perfectly clear and I told to the people “this is not the real cover for the new Greatest Hits -USA”. I’m sorry if somebody used the information without checking what it really was. My blog is in spanish. If somebody wants to know about what I writed in spanish please ask me before give wrong information that i never wrote. Or please check with Judith. She knows spanish. By the way… I really love this picture!. It is from 1995 and is taken from a Japanese Magazine. Thanks…. In the end it’s a funny story and I had a good laugh. By the way, after a second look on it, I have to admit that it’s not THAT bad… I mean, now that I know that this was made by a fan, I have to say that the picture is funny. It really shouldn’t be the official one, but for a selfmade cover, why not?! I actually love the picture. Anyway, It’s common to use ‘old” picture for Greatest Hits album. I’m almost sure that’s what Roxette’s going to do. The “Hits” cover is just recycled pics from 1995, and only half of Per’s face was used. The editing was also quite amateur-ish. Plus, the back artwork picture is really ordinary (the pink tint makes it even worse). The same goes for the generic font used… I never liked that release. Some US satellite radios have been playing She’s Got Nothing On (But The Radio) as well. @alekslerin: Thanks for posting, but I do hope it’s a fake again due to the bad typography (in terms of ‘Scandinavian design standards’), if you ask me. The spacing of the ‘double T’ in Roxette looks not very profesional. The two Ts should have been moved together closer to avoid the big gap. I like the picture, though. It´s was sent to me from EMI Capitol USA. And It´s not a fake again because as I already told to everyone I never wrote the red cover is the real cover. I wrote very clear “it´s not the real cover” in spanish and somebody put some word for me i never wrote.